“Welcome to the Old County Ground for this year’s match against Lashings World XI. 2012 is a great year for sport. 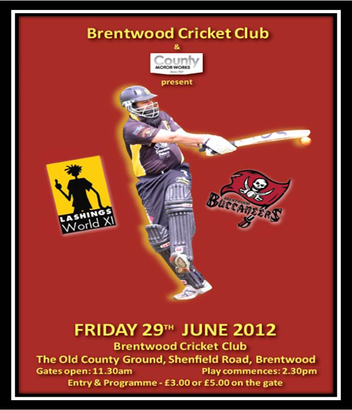 As well as the small matter of the Olympics and the European Championships, we see Brentwood aiming to win a fourth consecutive Shepherd Neame Essex Premier League title…and of course we have the exciting rematch between Brentwood Buccaneers and the Lashings World XI. Anyone who was able to join us for the match and/or the luncheon last year will surely agree that it was a great day. Although the weather conspired to bring a premature end to what was looking like a fantastic finish to a great game of high class cricket it did little to detract from the overall occasion. We, perhaps cheekily, claimed a one run victory courtesy of Messrs Duckworth and Lewis so we are expecting a backlash this year. There is a suggestion that had the game got too close at the end Devon Malcolm might have lengthened his run up and bent his back a little more but David Folb, Lashings’ Chairman, tells me that perhaps even that might not have been enough, such was the quality of our play. English Cricket is flying high at the moment. At the time of writing England are the number one Test team in the world (just) and have just swept aside Pakistan in the ODIs. Our 1st XI, the “Buccaneers”, have had similar success in recent years having won back-to-back-to-back Premier League titles. It is some achievement to have won it in 2009, 2010 and 2011 and no club has ever won it for four consecutive seasons so this year will be a real test. The boys also brought home the DukesTwenty20 Cup last year so have shown their strength in all forms of the game. All that evades us at the moment is success in the National Cup. Our on-field objective for 2012 therefore is simple – win a fourth Premier League title, retain the Dukes Twenty20 Cup, win the National Cup and beat the Lashings World XI…again! Brentwood Cricket Club is not just about the 1st XI though. We have real strength in depth through five League sides, all of whom play in the highest division of the Shepherd Neame Essex League that they are able to play in. All of the sides are peppered with youth, much of which has been cultivated and nurtured through our Colts section. That Colts section has also seen its fair share of success recently, winning trophies and leagues at Under 11, U13 and U15 level. We also encourage Sunday cricket through our ‘Victorians’ XI as we strive to offer cricket to all. We are immensely proud of our achievements throughout the Club and we are hopeful that there is still more to come. As you will see today we have now completed the £500,000 redevelopment of the pavilion and we are delighted with the finished product. Now we just have to pay for it. We want to create something here, both on and off the field, that is truly the envy of other clubs and we particularly want to create an atmosphere and a vision that can allow us to offer cricket to the local community for many years to come. Cricket has been played here for over 130 years and we want to set something up to allow it to flourish for another 130 years. With Brentwood’s recent success and increase in media coverage there is no better time to become involved with Brentwood Cricket Club. I would like to take this opportunity to thank you for your support and acknowledge how valuable that support is to us. I would like to reserve a special thank you to our sponsors, Essex & Anglia Preservation, StockBrook Country Club and CIK Construction. Your support is so important to us so I thank you all. 2012 promises to be another exciting campaign; I very much hope that you will become and remain part of it. I am delighted and proud to welcome Lashings back to the Old County Ground. As last year, I’m sure the day will once again live up to high expectations and that we will be suitably entertained by some of the finest cricketers that their country and generation have had to offer. I do hope you have a great day, whether you are enjoying the match and the hospitality from the marquee or taking it all in from around the boundary’s edge. And let’s hope for another Buccaneers win! Lashings World XI 262-4 (30 overs). Brentwood Buccaneers 259-8 (30 overs). Lashings World XI won by 3 runs. A thrilling encounter between Brentwood cricket Club and Lashings World X1 ended in a three run last ball victory for Lashings in front of a large crowd on Friday. 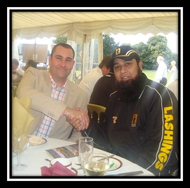 The Lashings line up included legends of the game Mohammed Yousuf, Gordon Greenidge and Courtney Walsh. Lashings made first use of an excellent wicket against a depleted Brentwood attack. They are still unfortunately missing injured front line seamer’s Tom Moore and Joe Buttleman from their attack. Harry Jones started proceedings with a maiden which turned out to be the only one of the game on a day full of runs. Openers Lou Vincent and Ian Harvey used the short boundary and wind to great effect lifting Jones effortlessly at times into the trees. At the other end Max Osborne bowled well and had Harvey caught at fine leg for 21. This brought Imran Nazir to the crease who along with Vincent started increasing the tempo hitting regular boundaries all around the wicket. West and Saunders came into the attack bowling accurately but keeping these batsman in check was proving tough on such a fine wicket with a lightning fast outfield. More spin was brought into the attack in the form of Sam Pountney who bowled tightly and was rewarded the wicket of Nazir after a fine catch from Aaron West. However this brought Mohammed Yousuf to the wicket. One got the feeling he could hit the ball wherever he wanted and he did. At the other end Vincent really started to open up, with Belchamber taking some serious punishment. The run rate was really starting to pick up and it seemed there was no way to stop it. Young sixteen year old Harry Levy hadn’t bowled at batsman of this calibre before and was hit for a monstrous six over the marquee. Vincent brought up his century with another brutal shot but was caught by Osborne off the bowling of West for 110. Sam Pountney came back into the attack and had Butler caught at long off and then it was left to Mohammed Yousuf to take centre stage. His amazing range of shots had skipper Jon Walford wondering where to put his fielders. He played several shots inside out over cover which had the large crowd and the Brentwood players in awe. He finished with a majestic 86 Not Out and Brentwood were facing a daunting chase of 262. Sam Pountney, the limited overs specialist was the pick of the bowlers with 2/27 off his 5 overs. Brentwood needed to come out all guns blazing to have any chance and got off to a fine start with Walford and West regularly finding the boundary. Devon Malcolm and Mohammed Akram bowled well but there wasn’t much margin for error on this pitch with Walford feasting on some short pitched bowling and West brutal on anything over pitched. They had put on 75 in 9 overs by the time Walford was unluckily caught of the back of the bat from a short pitched delivery from Courtney Walsh. This brought Hammond to the crease who cleverly rotated the strike to let the in form West pounce on anything loose. He was really starting to let loose before chipping Saqlain Mushtaq to mid wicket. Run scoring was a lot tougher against Saqlain. He appeared to have a different delivery every ball and got his own back for a Hammond maximum by pinning him in front off middle stump LBW. Osborne came and went with a quick 18 and this left Joe Buttleman facing an uphill task with the run rate creeping over 10 runs per over. Along with Ronnie Saunders they rotated the strike well and were still hitting boundaries keeping Brentwood in the game. New Zealand international Ian Butler was now into the attack and bowling quickly and accurately. Buttleman hit Saqlain’s final delivery handsomely over the boundary and this appeared to kick start his innings. He had to do something special to keep Brentwood in this game and he didn’t fail to deliver. He was in his element in front of the large crowd and sized up Mohammed Akram, punishing any length delivery to the boundary. Saunders had his middle stump removed by Butler, but Buttleman was keeping Brentwood in this game. He hit Butler into the wind on top of the pavilion and then was dropped on the boundary by Vincent. The people who backed Lashings at 1.01 on Betfair were starting load their guns when Vincent came into the attack and 40 were needed from the final two overs. He bowled right in Buttleman’s slot, going for three huge sixes and somehow the target had reduced to 14 off the last over. It was still a tough ask against an international seamer of the class of Ian Butler still in his prime, but Buttleman who was in the zone knew it could be done. A boundary and a single meant Guy Balmford was on strike with four balls to go and 9 runs were needed. His attempted ‘ramp shot’ failed and he was cleaned bowled. Pountney came to the wicket and had to get Buttleman on strike. He missed the ball and Buttleman ran through to the keeper but Pountney was run out at the other end. 8 required off two balls and an inside edge past the man at short fine leg meant this game was going to the last ball. The way Buttleman had played, Brentwood were almost favourites. Unfortunately, Butler produced a rapid, straight yorker which was too good and Buttleman was bowled for 82, bringing a 3 run victory to Lashings. Brentwood could be proud of their efforts. With a full Brentwood attack, Lashings would have certainly scored 20 or 30 runs less and Brentwood may have stolen the show. Their batting was awesome, with everyone getting in and scoring freely. Buttleman deservedly took all the plaudits with ball striking off immense quality and everyone one who watched the game could only be in awe of this breathtaking innings. He was rightly named Man of the Match by Lashings World XI Captain Phillip DeFreitas. Match Report Courtesy of Ian Belchamber.